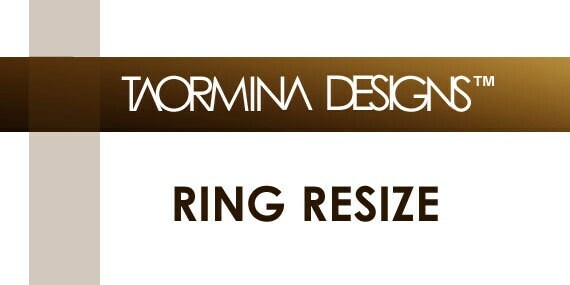 All Taormina's Tension Rings and Wedding bands are create to the exact size provided to us by the Buyer. For technical reasons, Stainless Steel Tension Set Ring and Stainless Steel Bands cannot be Resized, therefore any error on selecting a size or just a simple resize necessitates the crafting of a whole New Ring. we will make a new whole ring for you in exchange to the wrong sized one. My engagement ring was resized and more beautiful than ever! Just received my beautiful ring that needed to be resized. It is amazing how a hand made item can differ from one another, even though they are really the same. It has character and charm. At the same time, - as always - it is smooth, simple and beautiful! Can not wait for my next one:) thank you!!!! Oh Lord! I have just received my ring back as i needed to get it resized. I thought i was dreaming when i opened that box! It is beautifull, unique, truelly one of a kind! I have bought six rings from Mr. Taormina so far and these pieces are the only head turning rings i have ever owened! Amazing crafmanship, beautiful design and clean, simple look! Thank you! Really great with returns and exchanges.